I could possibly be the only girl that doesn't know how to use a curling wand. 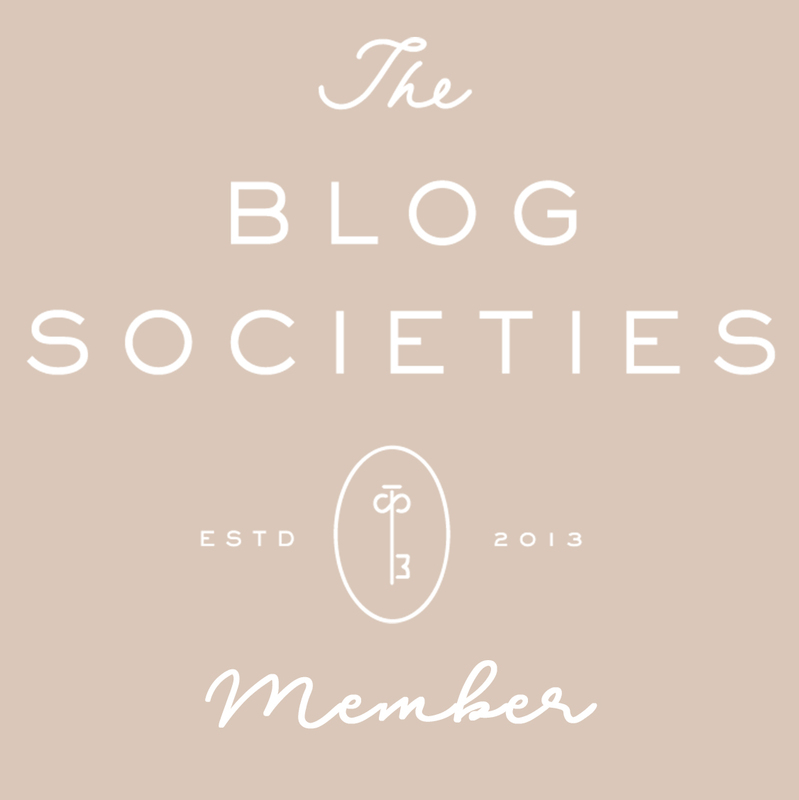 Seriously, ask all of my friends! 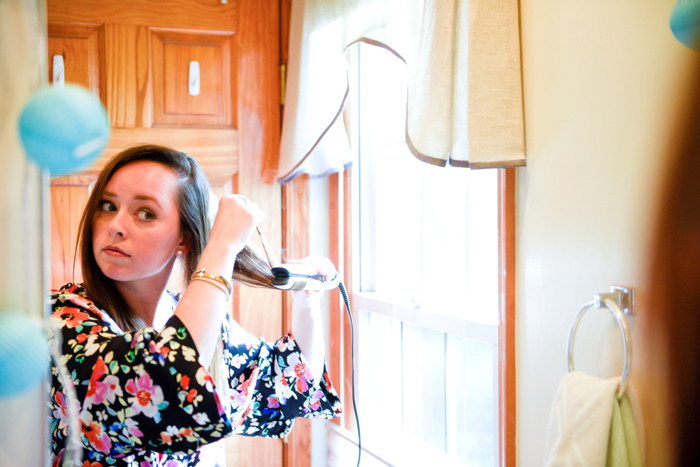 I travel with two hair tools: my blow dryer and my straightener. When I was a baby I grabbed a hot curling iron with my bare hand and have been scared of them ever since. 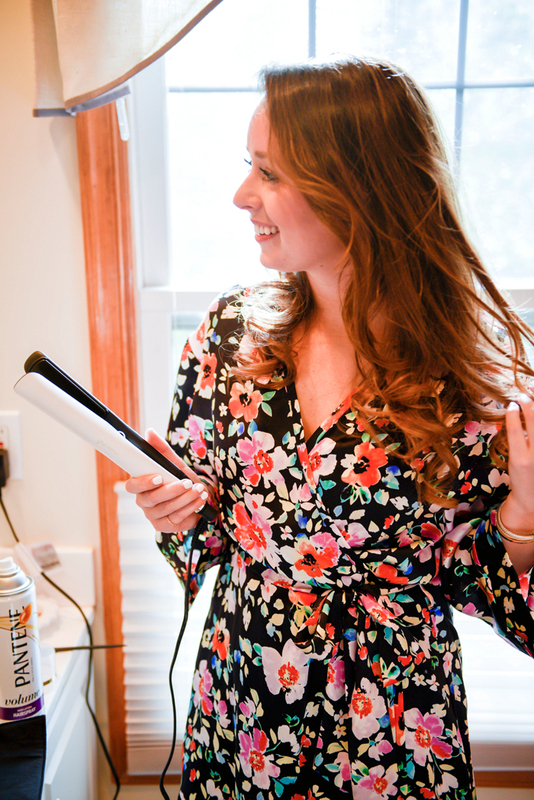 I also don't like to overpack hair products/things (I save room for shoes) so as a teenager I taught myself how to work my straightener to give me sleek, straight hair and bouncy curls all from the same hot tool. So now... 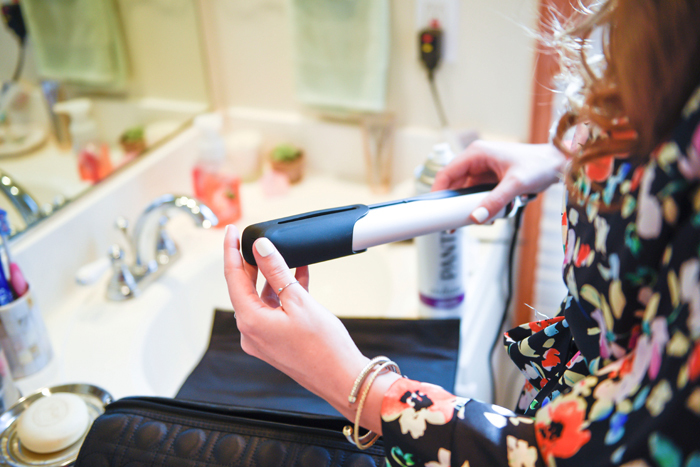 I'm spilling my secrets on how to get perfect curls (ringlets or beach waves) with your trusty straightener - or my newest obsession, the ghd platinum styler! 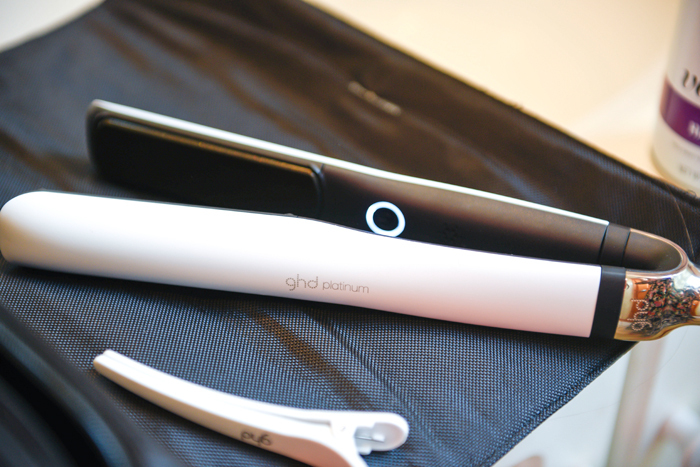 It comes in a neat rolling pouch that has a detachable heat resistant pad to set your straightener on. Along with a rubber end to keep the straightener "closed" while traveling. 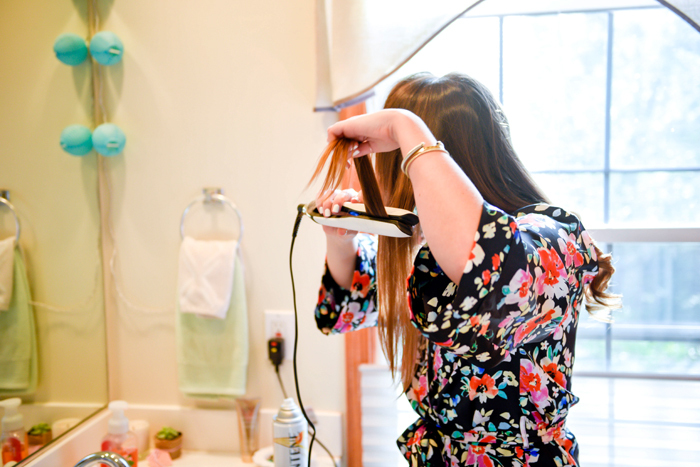 First things first - While your hair is wet work in some heat protectant, split end therapy, or blow out balm. Whatever you like the best for your hair type! Then blow out your hair to give some volume to your roots. Next, give your hair a good coating of hairspray and run a comb through it to get rid of any knots. I part my hair where I wear it every day and split it in half, at the back, putting each side over my shoulder. 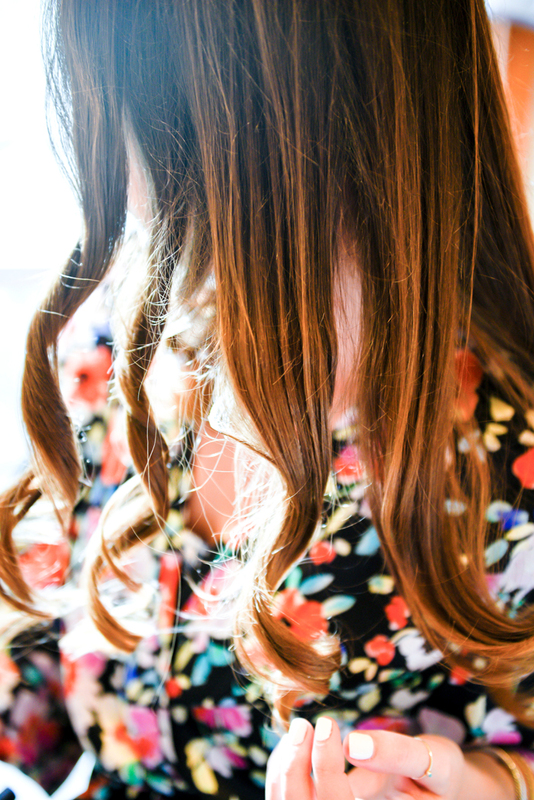 Starting at the back of your head grab sections of hair to begin curling. 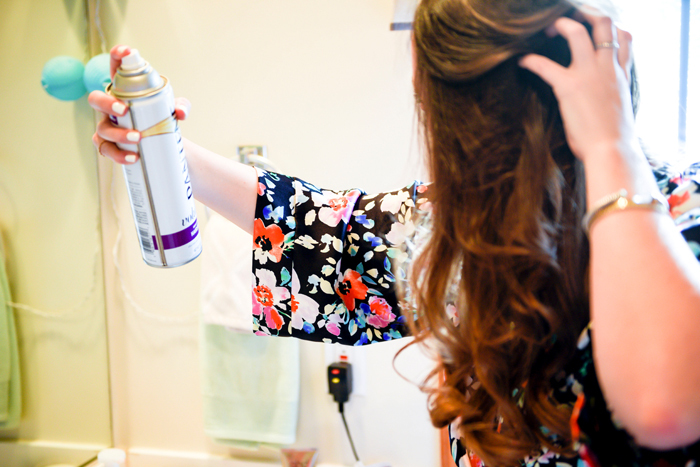 Spray each section you grab with another layer of hairspray (I like a fine mist so that it doesn't look crunchy - I layer on hairspray instead of creating a helmet to hold a curl in place. 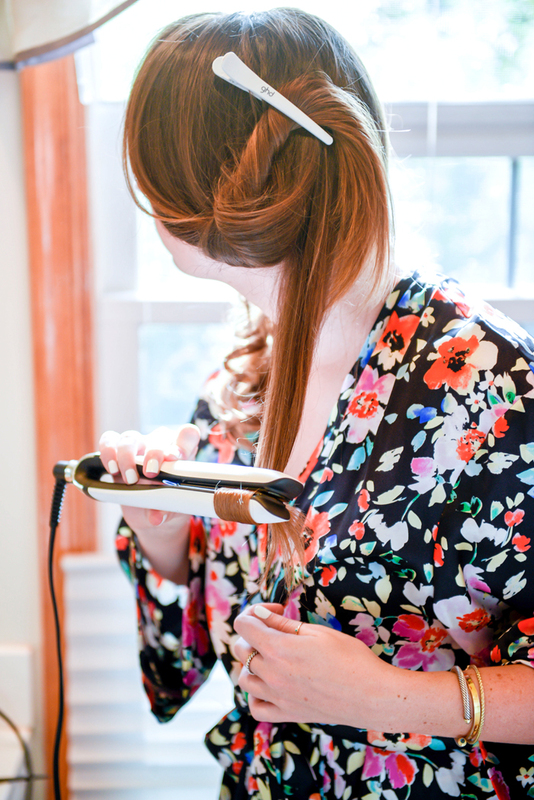 This makes the curls look more loose and easy instead of "pin curl perfect"). 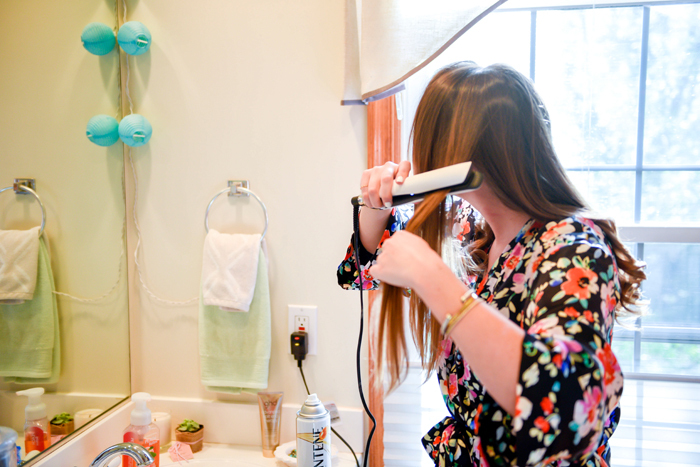 This is where the "flick of the wrist" comes in to play... Place your straightener just like you would normally but then begin rotating it up and towards you. 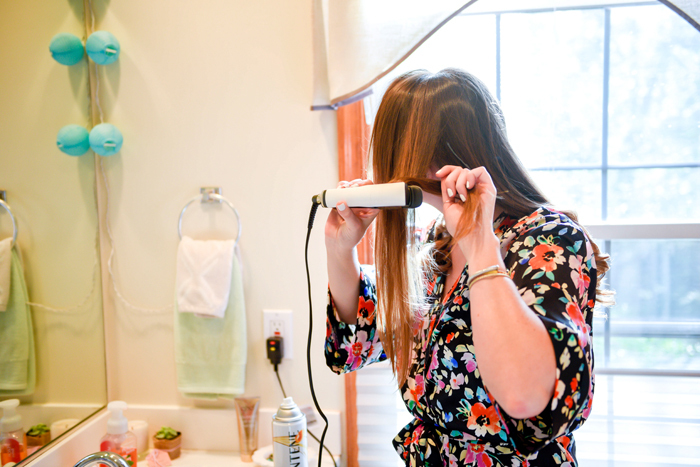 The ends of your hair will then be on the side of the straightener towards your face (because you just rotated it 180 degrees). 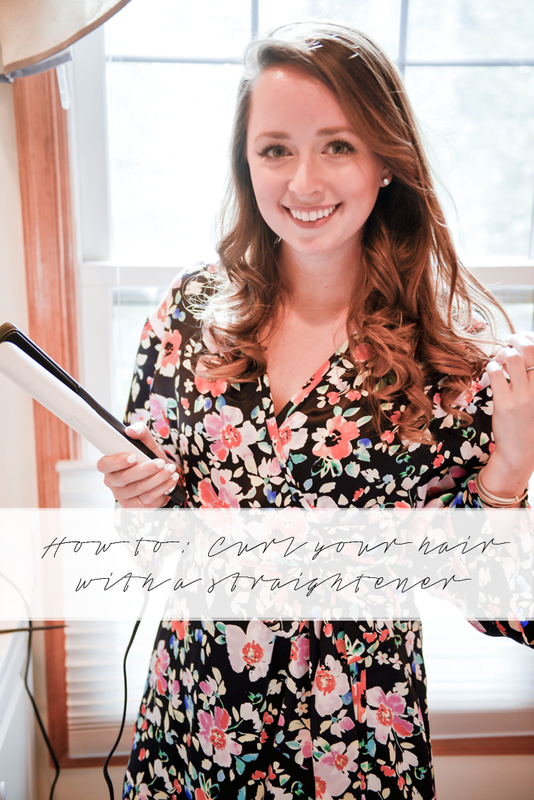 It kind of looks like it would if you were wrapping your hair around a curling iron but instead you pull the straightener down your hair to distribute heat. You want the hair that's being pulled tight to be in between your face and the loose end of the section - so if you are curling the left side of your face, the ends will fall to the left of the section you're curling (like the photo below). I like to grab the ends to make sure they don't slip out of the straightener as I pull the straightener down my hair and get nearer to the bottom of the section (like the photo above)! 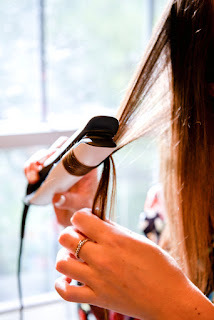 If you want tight ringlets then rotate your straightener even more and pull your hair through slowly. This will reinforce the curl with heat. 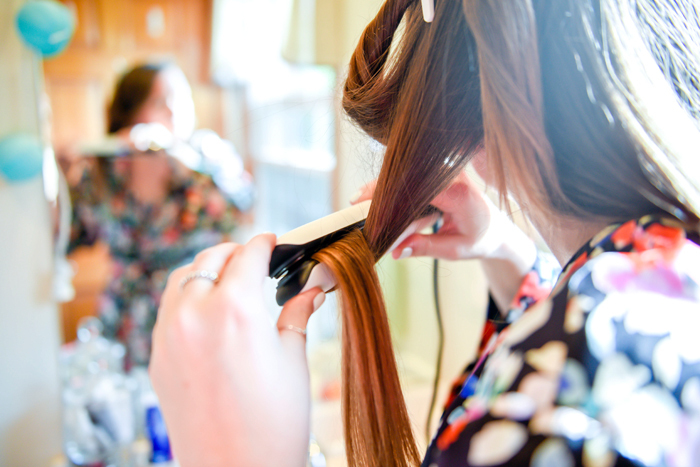 If you want a loose wave, then pull the straightener down your section more quickly and release the hair before you get to the ends. I also use my straightener just to get wavy ends for work. 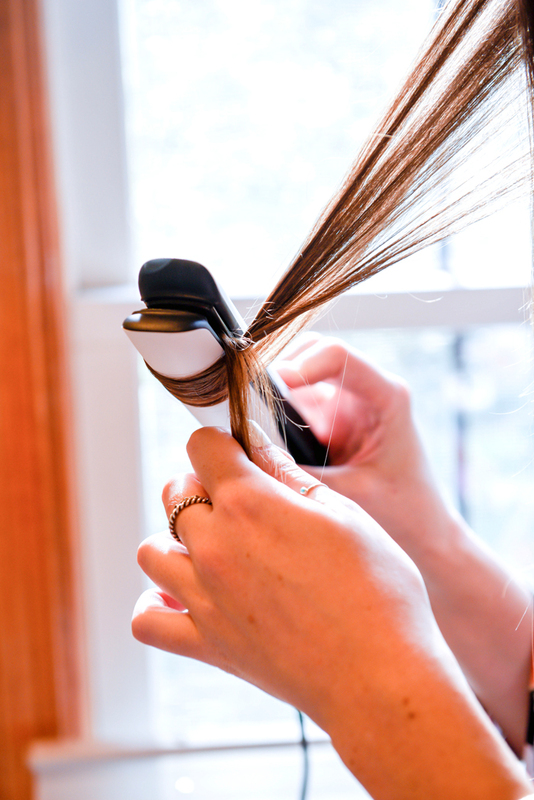 Once the section is curled, twist it around your finger and coat it lightly with more hairspray - this helps reinforce the direction you want the curl to go. Don't brush it out yet - let all of the curls cool before finger combing them! Remember, always curl away from your face. But honestly, if your hair won't curl away... who really cares? Once you finish the first side of curls move on to the next - starting at the back of your head. I've been using the hair clamp (is that what it's called?) to hold the front part of my hair out of the way so I can see the back curls more easily! 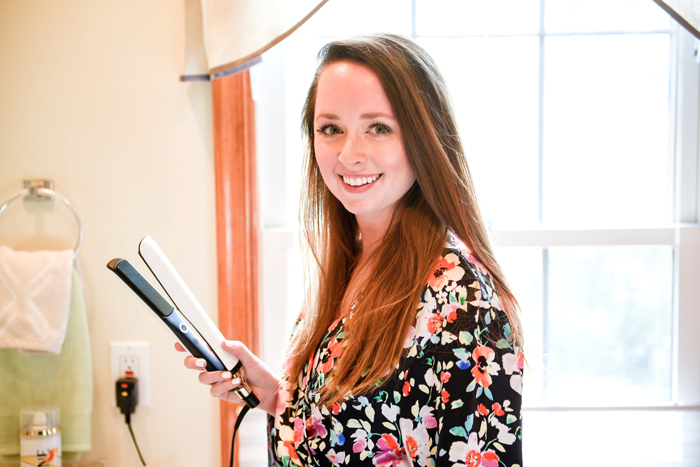 In the three photos below you can see how I rotate my straightener towards me while flipping the ends over the straightener at the same time - pulling my hair through to begin curling away from my face. Final steps: You guessed it... coat with a fine mist of hairspray and lift at your roots. 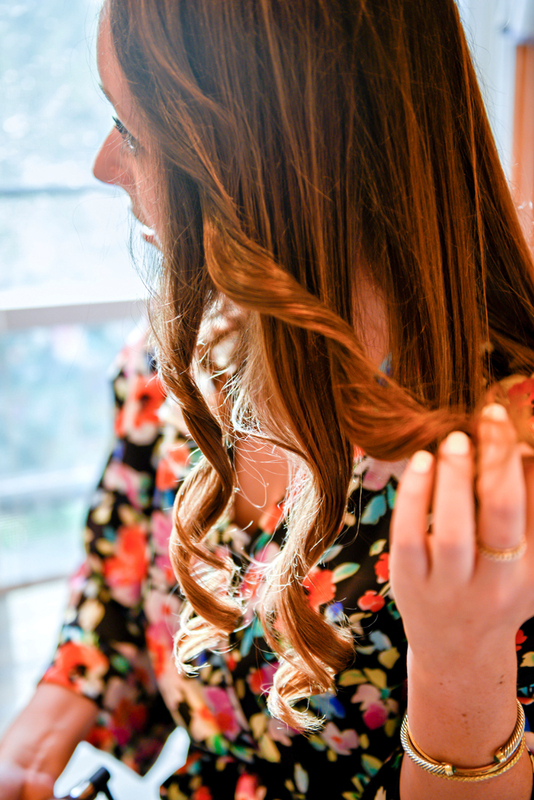 Loosely brush out your curls with your hands to break up any ringlets (the worst if you want an effortless look) that are lingering so it looks more natural! You can tease your roots to lift any volume and touch up pieces that got missed. 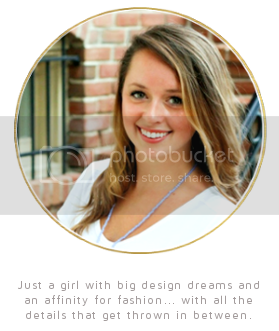 Your hair literally looks like you used a curling iron - so good!